Explore an illustrated history of the world through over 140 timelines for kids. 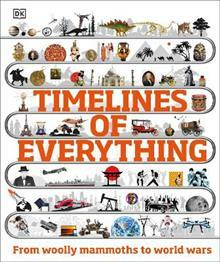 From dinosaurs and Vikings to the history of cinema and espionage, discover incredible world history in this lavish collection of timelines.Jam-packed with surprising facts and amazing details, such ... read full description below. Explore an illustrated history of the world through over 140 timelines for kids. From dinosaurs and Vikings to the history of cinema and espionage, discover incredible world history in this lavish collection of timelines.Jam-packed with surprising facts and amazing details, such as the most bloodthirsty pirate of all time and the first crime to be solved by studying fingerprints, Timelines of Everything will take you on a whirlwind journey through an illustrated history of time, from the Big Bang to the modern world.More than 140 timelines give you all the general knowledge you need - and even some surprising trivia you don't! Must-know topics and alternative history are showcased with beautiful, detailed illustrations and straightforward, easy-to-read text. Whether you want to know key breakthroughs that set the Industrial Revolution in motion or defining moments in the history of fashion, you'll find it all here. With timelines on a diverse range of subjects, Timelines of Everything is the ultimate guide to history for kids.